Observations from the latest research keep coming in to support ICR’s CET model. Creatures appear to respond to changes in their environments by making suitable self-adjustments generated by their own built-in biological mechanisms. The Institute for Creation Research is developing a theory of design whose main assumption is that engineering principles can be used to explain biological functions. From this, we are building a design-based adaptation model called continuous environmental tracking (CET). When it comes to the biological function of adaptability, ICR’s model hypothesizes that if human engineers can use a tracking system to detect and maintain surveillance of a moving target, then creatures could employ a similar strategy to track and adapt to changing conditions. Human-engineered tracking systems incorporate three well-matched elements: input sensors, programmed logic mechanisms to regulate an internal selection of adaptable responses, and output “actuators” to execute responses. It is the programming in organisms that specifies a condition “to be” a stimulus. Individual sensors are “tuned” to match specific environmental conditions. An organism’s sensors are the “effective” triggers for their responses. Engineering principles also apply to the programming of the logic mechanisms underlying biological functions. Creatures use these mechanisms to control their self-adjustments through a series of internal on-and-off switches. Hard metallic transistors can function as switches in electronics, but in living cells switches are made from extraordinarily complex pathways and interactions utilizing highly specified protein molecules. 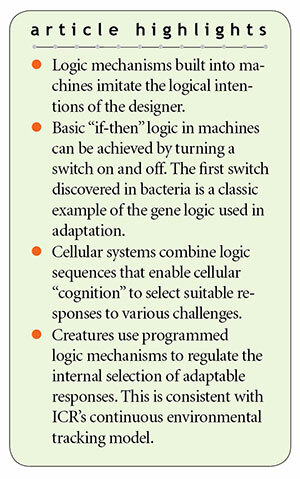 Remarkable Discovery—Cell Systems Can Implement Logic! Researchers’ careful observation of E. coli bacteria in the 1960s gave clues to how these protein switches operate. Normally, the bacteria in the study would break down the sugar glucose for energy. But when glucose was withheld and another sugar, lactose, was introduced, the bacteria started making the necessary enzymes to metabolize lactose. Analysis of this phenomenon revealed a system consisting of a sensor for lactose, an internal logic-based selection mechanism for “glucose or lactose,” and output responses to produce the suitable enzyme to break down lactose. Somehow, the bacterium senses the presence of lactose and is induced to make the right enzyme when it is needed. How can such a simple cell “know” what enzymes to make? How is the right enzyme induced by the appearance of the very compound it breaks down? The answers to these questions were worked out by François Jacob and Jacques Monod, who along with André Lwoff shared the Nobel Prize in 1965 for their discoveries…. These bacteria are likely no more aware of these automated functions than humans are of those happening within themselves. Yet, they function just like human-designed autonomous adaptable entities that use internal logic-based selective responses. “If-then” logic enables an internal selection of the correct solution to different challenges, an innate system that closely imitates the conscious logical intentions of a designer. Thus, it seems that tracking environmental changes is a function of organisms, some organ systems, and even cells themselves. It also looks as though the same elements of sensors, logic mechanisms, and output effectors are used in similar systems all the way down. Observations from the latest research keep coming in to support ICR’s CET model. Sensors bridge the space between organism and environment and are themselves marvels of engineering. But the logic mechanisms—which are designed to mimic the way cognitive beings think and implement suitable selections—seem to resist any explanations involving death-driven, mindless, and random evolutionary trial-and-error scenarios. 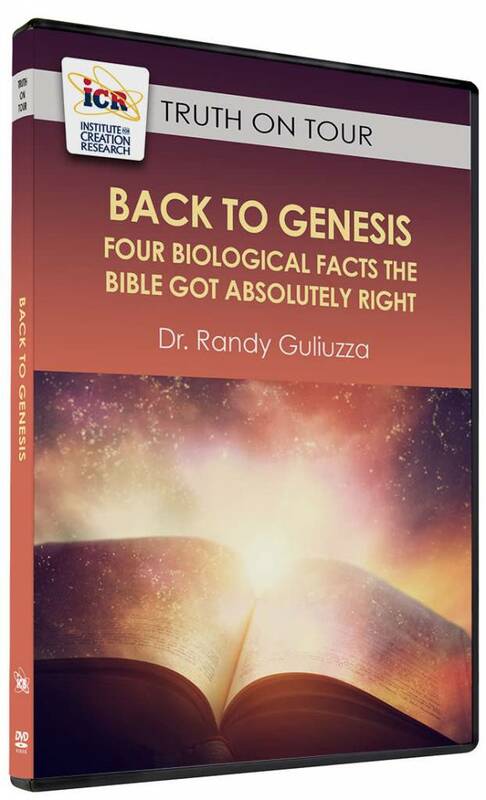 We get a glimpse into the magnificent and infinite mind of their Designer, the Lord Jesus Christ. Programmers use logic-based programming when they want to implement their decision-making intentions through an independent entity. 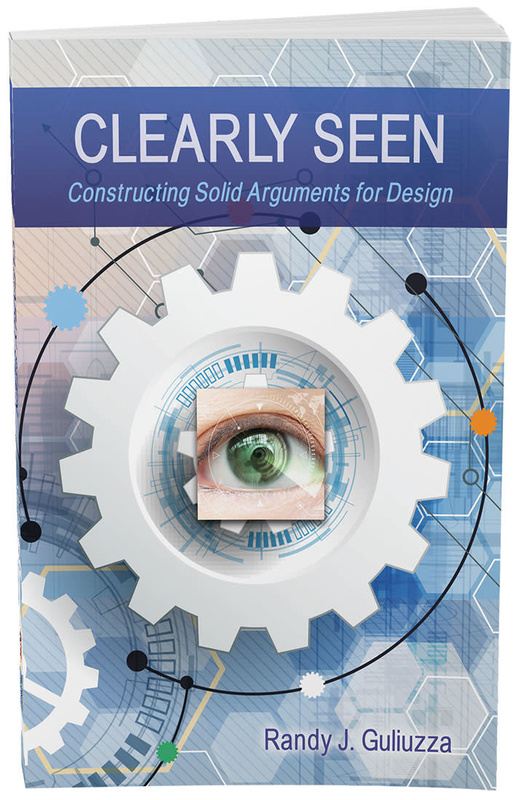 So, when we see microscopic cells carry out thousands of highly complicated logical decisions with exquisite precision, we get a glimpse into the magnificent and infinite mind of their Designer, the Lord Jesus Christ. Guliuzza, R. J. 2018. Engineered Adaptability: Sensor Triggers Affirm Intelligently Designed Internalism. Acts & Facts. 47 (2): 17-19. Carroll, S. B. 2005. Endless Forms Most Beautiful: The New Science of Evo Devo and the Making of the Animal Kingdom. New York: W. W. Norton & Company, 55-56, 58-60. Mazur, S. 2015. The Paradigm Shifters: Overthrowing ‘the Hegemony of the Culture of Darwin’. New York: Caswell Books, 20, emphasis added. Cite this article: Randy J. Guliuzza, P.E., M.D. 2018. Engineered Adaptability: Logic Mechanisms Direct Creatures' Innate Adaptability. Acts & Facts. 47 (11).